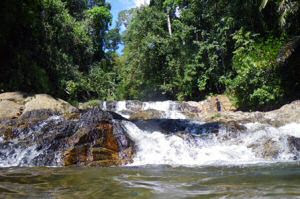 The closest waterfall to the Lake Kenyir Resort is the Soak Waterfall. You can get yourself a driver and go there or you can combine it with a visit to the Herb Island, which is a good deal, as still it's only a 2 hour trip. Herb Island is about 20 boat minutes away from Lake Kenyir Resort and when you hear how much different herbs are growing on the island, you know how utterly sad it is for mankind to replace all that with one crop of palm trees. Another 10 boat minutes further lies the quite flat Soak waterfall. Since you are in the tropics, exposing your skin only a few minutes in the sun can already give you a sun burn. Don't get optimistic, as you can get sunburned as well in the shadow and especially when bathing in one of the little pools around the Soak waterfalls. We advice always to wear a cover up swimsuit, not only to protect you from the sun, but also from the glaring and staring eyes of village or the Muslim population in Malaysia. Get inspired what the locals do and wear and you will not notice any local wearing a tiny bikini. Sarongs however are the cloth of choice to cover your body, your legs or to have something to sit on. And you will look quite exotic as well when you know how to fold a sarong the Malaysian way. Ask at the Spa in your resort to help you out, normally you will get a sarong with each Spa treatment. Do bring your strongest sun tan: Lake Kenyir feels a bit cooler than hot Kuala Lumpur, but the sun is still as powerful everywhere you go in Malaysia.